This may surprise a few people, but the number of Nurses, Midwives and Allied Health Professionals form the largest employee group in the NHS in Scotland… and is a significant part of the third and independent sector workforce. There are, no doubt, challenges for all working across health and social care right now. However my overriding feeling is that this is an exciting time for Nursing, Midwifery and Allied Health Professions (NMAHPs), particularly as together we have the potential to influence and deliver significant improvements in care at a time of real change. Given that context I was very proud to join Healthcare Improvement Scotland in May of this year as its first Director of NMAHPs. The organisation is adapting rapidly to a remit which has grown beyond the NHS and it now additionally supports the work of the new Integration Authorities. My key aim is to cement a strong relationship between the organisation and the NMAHPs working in this new landscape in order to support better care for people across Scotland. I have witnessed first-hand some of the many improvements that the work of Healthcare Improvement Scotland has been central to. The list is significant. 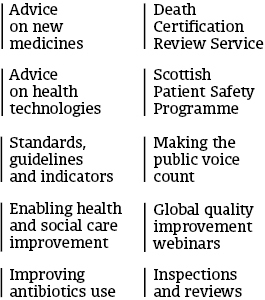 Improvements in older people’s care driven by inspections, improvements in services to vulnerable children and adults resulting from standard setting and joint inspection with the care inspectorate, the development and implementation of evidence based standards for practice and the use of medicines and technology, increased public involvement supported by the Scottish Health Council (part of Healthcare Improvement Scotland); the huge success of the Scottish Patient Safety Programme and the work, more recently, of the iHub in building strong integrated community based services. We frequently describe ourselves as having ‘many parts, one purpose’ and I have grown to understand why! As a direct result I am confident that care provided in acute and community settings is safer, more effective and more person-centred than ever before. We are fortunate in Scotland that there is currently an alignment of strategies. The Chief Nursing Officer’s 2030 vision for nursing, Active and Independent Living Programme and the Best Start strategy (the maternity and neonatal 5 year plan) along with Healthcare Improvement Scotland’s Strategy provides a platform for real and sustainable change in the way NMAHPs practice. This change will support the culture of continuous improvement fundamental to providing health and social care in today’s context. NMAHPs have a reach across all parts of Scotland’s population as they care for people throughout their lives and in many different settings. As a group, NMAHPs reach out to some of the most vulnerable in society, working to support those in greatest need those who sometimes don’t naturally have a voice. I would even go so far as to say that the skills and reach of NMAHPs are fundamental to the effective delivery of improvements in care – which is the very focus of Healthcare Improvement Scotland’s new strategy, Making Care Better. I recognise that there is a lot still to do, but I am hugely optimistic for our future. Our new strategy sets out a direction of travel for the organisation. However the strengthened relationships between Healthcare Improvement Scotland and the Nursing, Midwifery and Allied Health Professions means we can work together as part of a whole to provide the best possible quality health and Social Care for everyone in Scotland.